Of all the excess heat that results from people's emissions, 93.4% goes into oceans. 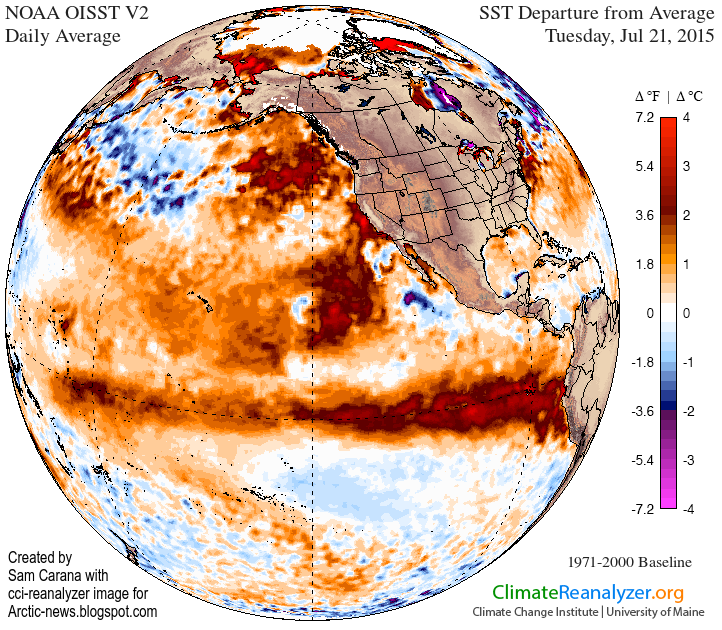 Accordingly, ocean heat has strongly increased over the years. 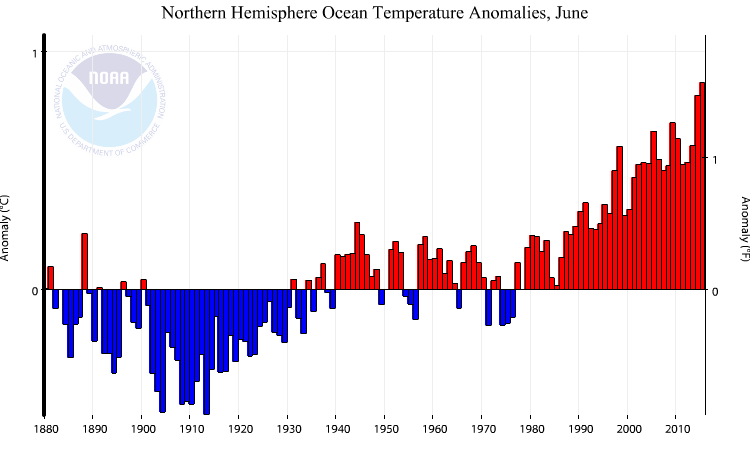 NOAA analysis shows that, for the oceans on the Northern Hemisphere, the June 2015 sea surface temperature was at a record high 0.87°C (1.57°F) above the 20th century average of 16.4°C (61.5°F), as also illustrated by the graph below. The most recent 12-month period, July 2014–June 2015, also broke the record (set just last month) for the all-time warmest 12-month period in the 135-year period of record. As the above image shows, sea surface temperature anomalies around North America are very high, threatening to further raise temperatures of the Arctic Ocean, which already has very high sea surface temperatures, as also illustrated by the image below. 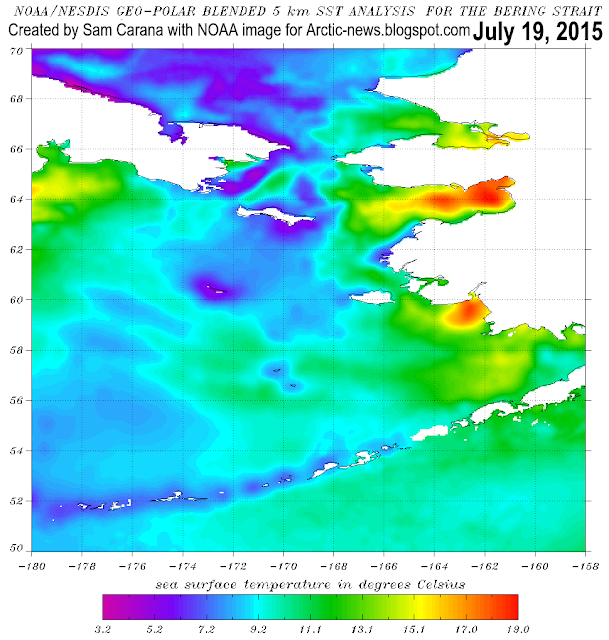 As the image below shows, sea surface temperatures as high as 19°C (66.2°F) were recorded in the Bering Strait on July 19, 2015. The snow depth comparison below shows the situation on July 20, 2015, on the left and a forecast for July 27, 2015, on the right. 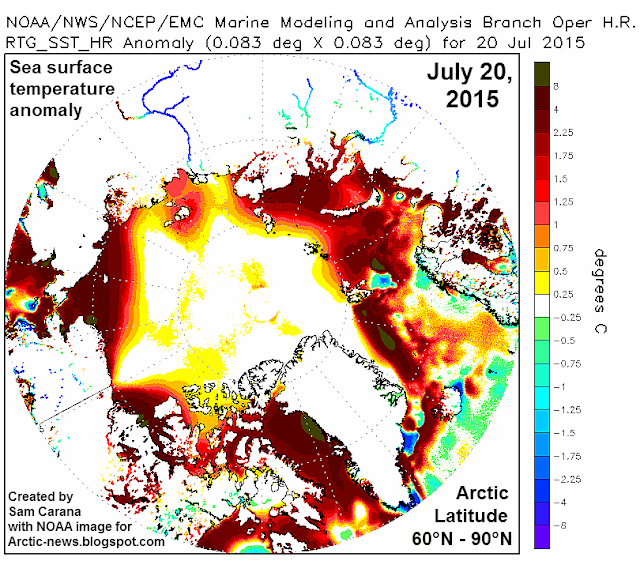 The green lines indicate areas where sea ice is at melting point. 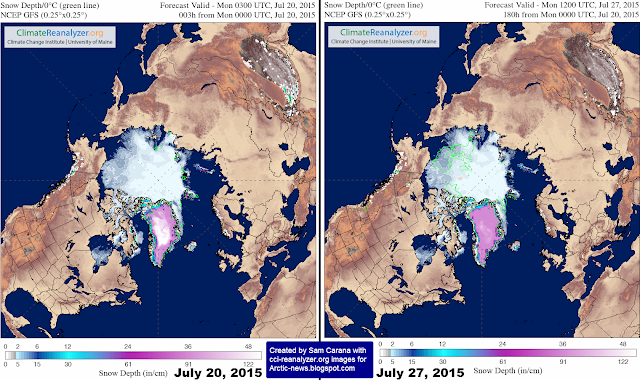 Note the decline of snow cover on Greenland and the Himalayas. As the continued snow decline on Greenland also illustrates, high temperatures can be expected to keep causing further decline of the snow and ice cover for many weeks to come, given that the minimum sea ice extent is typically reached about half September. 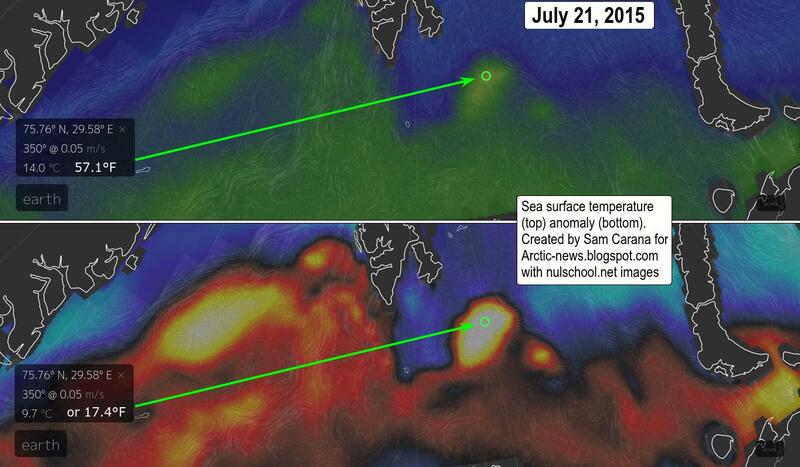 As the image below shows, sea surface temperatures as high as 10.1°C (50.1°F) were recorded in Baffin Bay, off the west coast of Greenland, on July 20, 2015. On July 21, 2015, temperatures as high as 14°C (57.1°F) were recorded east of Svalbard, an anomaly of 9.7°C (17.4°F), as illustrated by the image below, created with nullschool.net images. 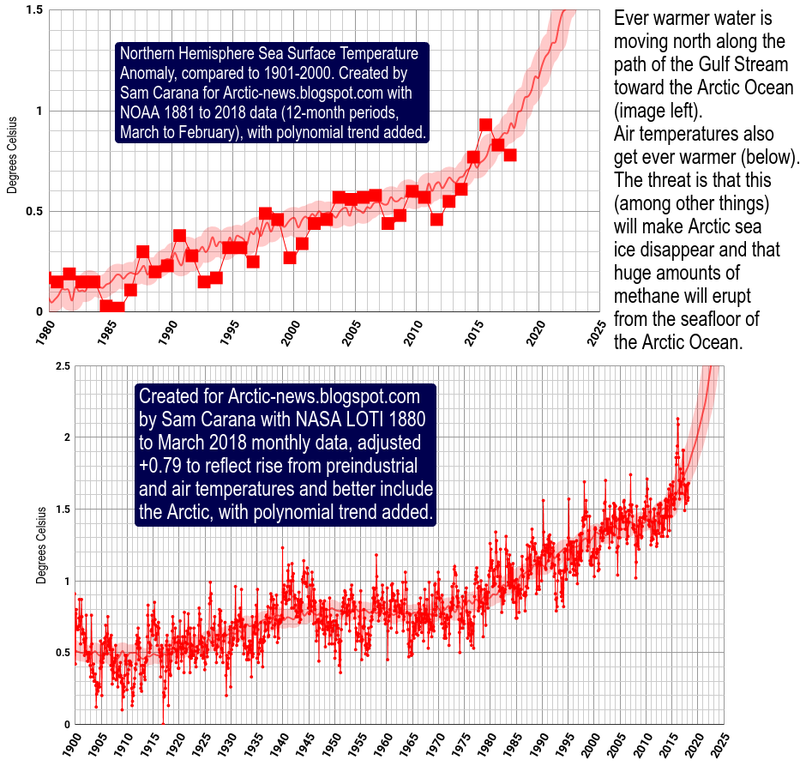 The danger is that warm water will enter the Arctic Ocean and cause the Arctic sea ice to collapse, which could make the Arctic Ocean absorb even more heat. 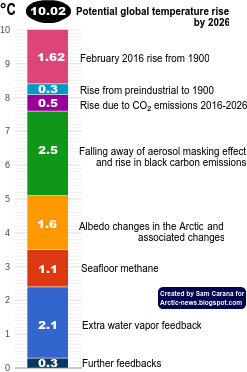 This could unleash huge methane eruptions from the Arctic Ocean's seafloor, in turn driving temperatures up even higher and causing more extreme weather events, wildfires, etc. Your article "Fracturing of the Jet Stream" I translated/adapted has gotten 140 +'s so far and was shared 44 times.